President Donald Trump promised an “unbelievable, perhaps record-setting turnout” for his inauguration, but it appears he fell short of a record. Photos taken from the same vantage point at roughly the same time during the inaugurations of Trump and Barack Obama show far fewer people on the National Mall on Friday, Jan. 20, 2017. Subway ridership figures released Friday also show a drop between 2009 and 2017. Various groups involved with the planning of Friday’s ceremonies — the Joint Congressional Committee on Inaugural Activities, the D.C. Department of Homeland Security and Emergency Management and the U.S. Armed Forces Joint Task Force-National Capital Region — predicted 700,000 to 900,000 would attend Trump’s swearing-in and parade. His predecessor drew what was originally estimated to be a record 1.8 million people to the National Mall for his inauguration in 2009. That estimate was provided by Washington D.C. officials, though The Washington Post later questioned whether it was too high. On Friday, ridership numbers from the Washington D.C. Metro showed a drop from the 2009 inaugural. As of 11 a.m. on Friday, it recorded 193,000 rides, compared to 513,000 at that time in 2009. Meanwhile, an expert told The New York Times the crowd on the National Mall on Friday was about one-third the size of the crowd for Obama in 2009. 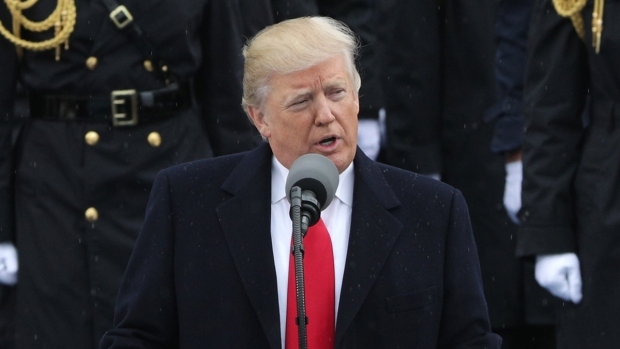 The Joint Congressional Committee for Inaugural Ceremonies distributed about 250,000 tickets for Trump’s inauguration on Friday, 1,600 on platforms and 1,000 on bleachers, which it said was on par for previous ceremonies. But most people attending the festival watch from elsewhere.